An innovative alternative to wall mounting, the VESA compliant Chief FSP-4212S allows you to attach a small flat panel display to any 1.5" to 2" (38 - 51mm) outer diameter (OD) pole. A wide range of tilt adjustment allows you to achieve the perfect viewing angle. Designed to support LCD flat panel displays under 30", the FSP-4212S incorporates Chief's exclusive Q2 Mounting System to provide easy installation, stable mounting, quick release and optional security (with the FSA1000 Lockable Latch). Ideal for digital display or retail signage, display can be installed in portrait or landscape orientation. 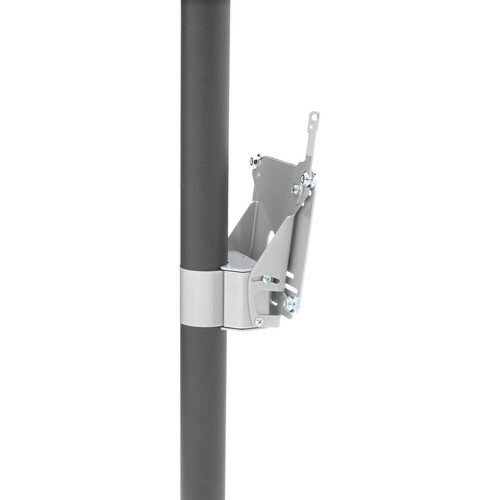 Includes pole clamp and interface brackets, and comes with a 10-year warranty. VESA 75 x 75mm and 100 x 100mm compliant. Non-VESA compliant interface brackets available. Universal clamp attaches to any 1.5" to 2" (38 - 51mm) outer diameter pole (pole not included). Quick, easy and versatile, exclusive Q2 Mounting System uses self aligning mating components, a steel latching flag and an optional security accessory to help you easily guide, latch and lock your screen to the mount. Due to its universal mounting pattern, Q2 allows you to install the display in either portrait or landscape mode, quickly and easily change out displays, or move a display between mounts. Includes pole clamp and interface brackets. Display installs in portrait/landscape views (pole can be vertical or horizontal). Easy tilt (10° up, 25° down) and yaw adjustments (360°) for viewing flexibility. Screen tilt can be locked at a certain angle if you want to use it for a touchscreen application. Mount goes through a series of rigorous tests to ensure a safe and secure solution. Box Dimensions (LxWxH) 8.5 x 6.0 x 4.25"